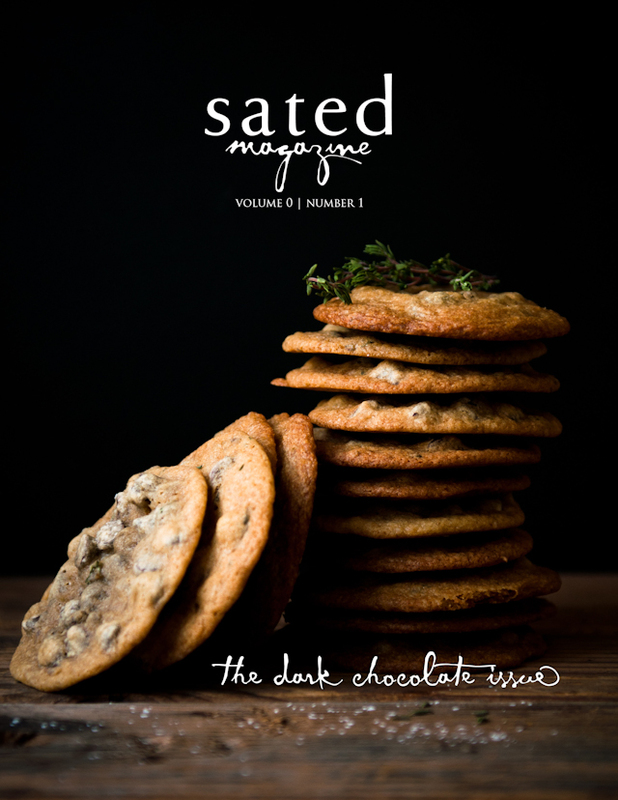 I know, I know--this is supposed to be a dessert blog, and here's yet another savory dish! But I promise, we'll return to sweet-tooth-satisfying desserts come next week. For now, though, I really wanted to share with you my ingenious (if I may say so myself ;-P) solution to not wasting all of those pea pods from which peas are shelled, just in case your heart aches as mine does when you have to throw them all into the compost bin. 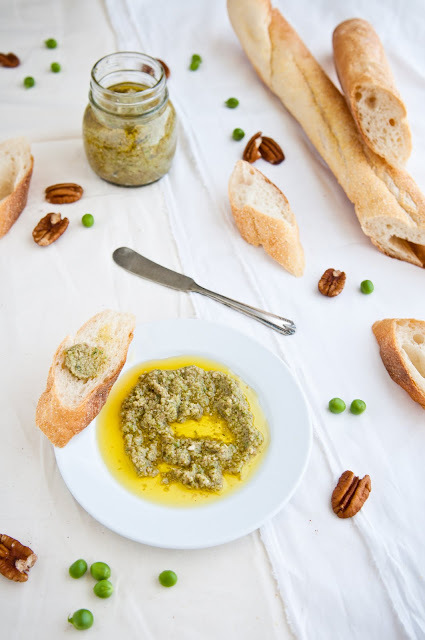 Here it is: pea pod and toasted pecan pesto! 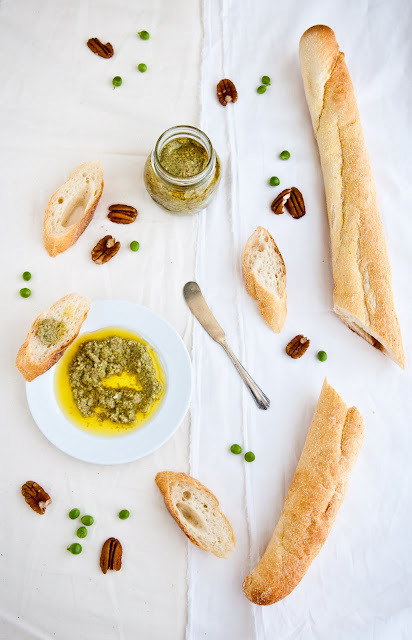 I really love experimenting with non-traditional pestos, and when I saw a heap of green sitting in front of me after shelling my peas for this week's pancakes, pesto was the first thing that popped into my mind for using them up. Then, thinking through the idea, the creaminess of pine nuts from a traditional pesto just didn't seem like quite the right accompaniment for the fresh, springtime taste of the pea pods, so instead, I opted for something nutty and slightly sweet: toasted pecans. I also threw in a handful of home-grown mint leaves to enhance the brightness of the taste of the pea pods and because peas and mint are a tried and true awesome combination. The rest of the pesto is actually quite straight forward: a punchy parmigiano, a healthy pour of fruity olive oil, one garlic clove for a bit of kick, and salt and pepper to taste. The resulting pesto was surprisingly light and fresh with just enough depth from the garlic, cheese, and toasted pine nuts to balance out the crispness of the pea pod taste. And, it was quite unexpected to boot, which I find to be a refreshing change from traditional basil-pine nut pestos. 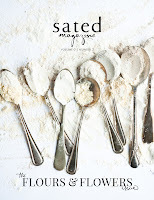 I served mine with gnocchi, and then the next day had it slathered on pieces of French baguette. 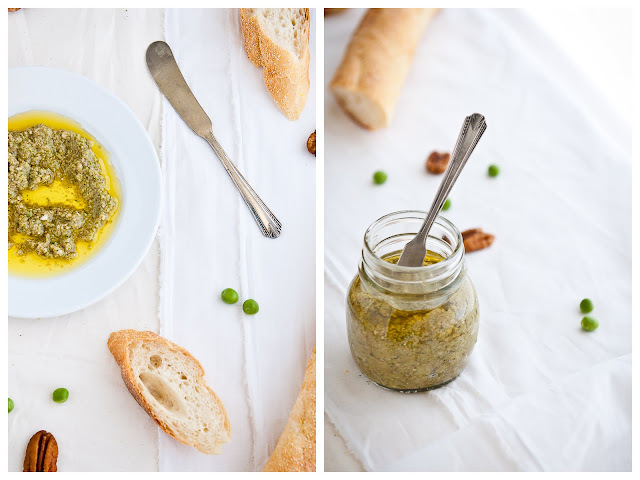 For some reason, though, I can't get past the fact that this pesto would go really well with lamb, but I don't really cook meat, so someone please try this pairing and let me know how it goes! 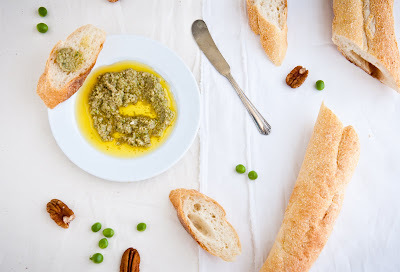 Be forewarned, though, that you should really, really like peas before you try this pesto, because you really get a concentrated flavor of peas from the pea pods. Note, also, that this recipe only works with sugar snap peas; unfortunately, English pea pods are still meant for the bin. What are some of your favorite non-traditional pesto experiments that have turned out really well? 1. Combine the pea pods, toasted pecans, mint leaves, smashed garlic clove, and grated parmigiano reggiano in a food processor. Pulse until finely ground and smooth. Beautiful photos, this looks absolutely delicious!! I love this!! gorgeous photo's too!! I say keep the savory coming, Steph! 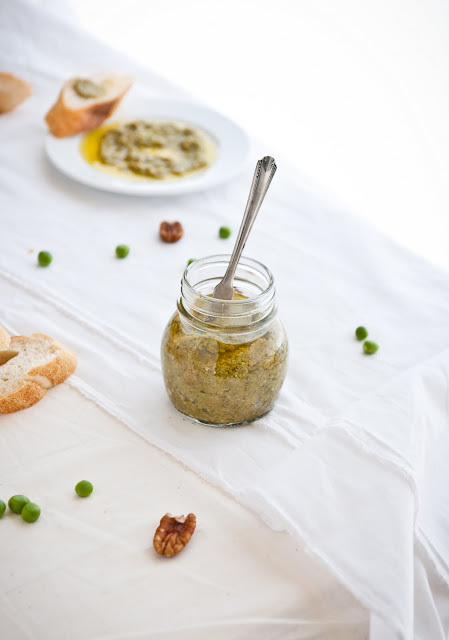 This looks like a great variation on the usual basil pine nut pesto. I made a zucchini pesto recently. I substituted zucchini for the basil and pistachios for the pine nuts. I also added a bit of mint for extra flavor. One thing I learned: go easy on the garlic because it can easily overpower the light flavor of the zuchini!